Synology, the maker of all things NAS, has just announced at CES 2016, a new NAS solution for home or small office use; the DiskStation DS416j, which is a 4-bay network attached storage (NAS), targeted at more comeptitive price points. Under the hood of the DS416j is the performance of a dual-core 1.3GHz CPU with 512MB of DDR4 memory (even with hardware encryption!) that can help stream your digital media collection over your local network to various DLNA-compliant devices. It can also wirelessly (dongle not included) stream content to your TV without much effort. 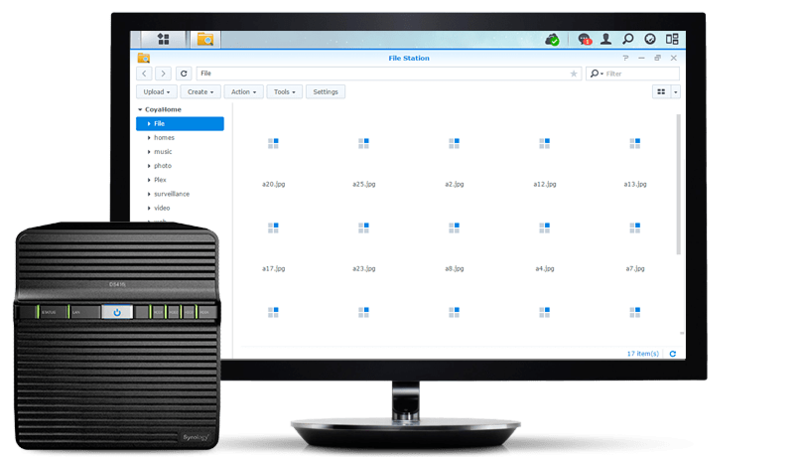 Included with all Synology NAS solution is their award winning DiskStation Manager (DSM) software. DiskStation Manager (DSM) offers a variety of software solutions from video streaming, photo sharing, even your own personal cloud, to more small business applications such as IP Security Camera surveillance recording, web server and more. If you are not familiar with DSM or Synology you can check out our review on the Synology DiskStation Beyond Cloud Mirror for Mac. Some other changes over its predecessor are features such as an increase of 37% to the write speeds, a built-in floating point unit (FPU) for loading things quicker (such as photo thumbnails) and comes equipped with not only a Gigabit Ethernet port, but also a USB 3.0 port for transferring files between the DS416j and another (USB 3.0 capable) device faster than before. For those who are curious about power usage for a device that is always on, the DS416j consumes only 21.6 watts under full operation with as as little as 12.75 watts when the drives are in hibernation mode. If you're looking for a personal NAS server that is easy to use and setup with some added features, then the DS416j may be right for you and they are shipping now. More photos and full press release below. "People are amassing photos, videos, and digital files faster than ever before, which means we need secure storage to centralize everything in one place, and a convenient way to access and share them," said Jason Fan, product manager at Synology Inc. "The 4-bay DS416j comes with rich applications and large storage capacity, letting users enjoy cloud synchronization and multimedia streaming at a competitive price." The DS416j runs on the DiskStation Manager (DSM), the most advanced and intuitive operating system for network attached storage devices. The DSM offers a wide range of applications for home and personal use: from backup solutions to multimedia software. Synology has earned several recognitions for its products, including the PC Mag Readers' Choice Award for four years in a row.